The Monday after Thanksgiving marks the one-year anniversary of Rookery South course superintendent Greg Thomas’ work at restoring damaged turf at the popular golf course near Milton. Thomas came to the course last fall from Hooper’s Landing, where he worked for several years on behalf of Chris Adkins’ course management company. The summer weather in 2016 brought some real challenges to Rookery South, forcing the re-sodding of the 5th and 12th greens, along with re-sodding of several tee boxes and other areas. That work occurred shortly before Thomas’ arrival on the scene. The newly sodded areas have come in very nicely. The two new greens are pretty much indistinguishable from the other 16 greens, from a playability standpoint. “Those greens are doing well. The root growth is still a little shallow, but they’ll get better with more aerification, top dressing, and fertilizer.” As Thomas explained, the sod did not initially adhere to the dirt below it as well as they hoped, but that situation has markedly improved. Thomas said, “The real challenge is getting the grass to grow with all the play that takes place here. The grass sometimes needs a little rest.” With an average of 30-35,000 rounds per year at Rookery South, restful interludes are not often seen there, except during the off-season months. “The regulars understood where we started from, and they’re appreciative,” Thomas said. The pond edges at Rookery South will be significantly trimmed back this winter. Thomas and his crew are already underway with their off-season projects to keep the course in good shape. They did a full-scale fertilizer treatment of the fairways, tees, and greens during the week of Nov. 12, using slow release potash. “Some of that stuff will help right now, and the rest will sit there until the warm-up this spring. Then the fertilizer will be there in the grass for the taking,” he said. The big project over this winter requires cutting down the growth along the seven ponds on the golf course. “We have to trim everything off the edges and clean it up,” Thomas said. At several locations, this means taking on phragmites, the foreign invader that has damaged thousands of acres of Delmarva marshland, crowding out native Spartina and other wetland grasses. 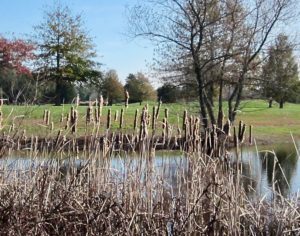 Reducing the phragmites infestation requires not only cutting, but also several applications of Round Up® herbicide. Thomas noted that several willow trees and a few chokecherries have also shot up along the ponds. “Those willows really like the water,” he said, Even so, some of these trees won’t be there after the trimming project is complete. That should help golfers track and find their golf balls when their trajectories go over the water features, a real problem at some spots on the course. He’s a bit too modest. Posting scores on the statewide handicapping system computers officially ended this year Nov. 14, two weeks past the Oct. 31 deadline that has been in place for over twenty years. State golf associations who have better golf weather year-round, such as Florida, set up their handicap systems for year-round posting. Despite some iffy conditions during the first two weeks of this month, Heien estimated that 6,500 scores would be posted to the DSGA handicap system computers for that period. The October posting totals for 2017 were above the previous year, 15,096 versus 14,171. Heien said the 2017 season totals will be 165,906, while there were 156,293 scores posted from April 1 through October 31, 2016. The extra two weeks of postings for 2017 made up over two-thirds of the difference. DSGA members who go south to play golf this winter should continue to post their scores from the year-round jurisdictions. For more information, go to dsga.org.